February is a month of sweet deals here at Taylor Volkswagen! 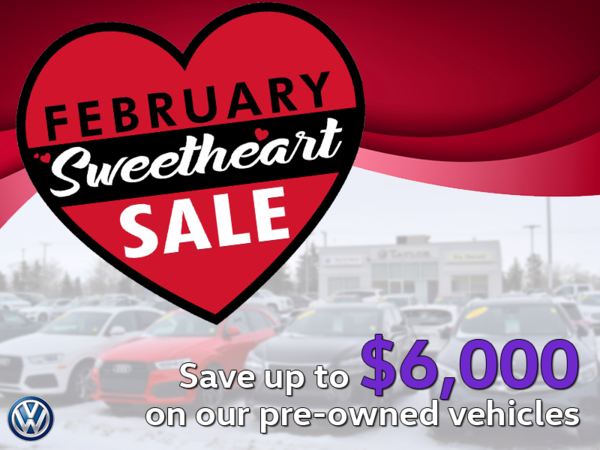 With one of the best diverse, pre-owned selection in Southern Saskatchewan, now is the best time to get into a new pre-owned vehicle for you or your sweetheart! There's a vehicle for everyone! With savings up to $6,000, our prices are highly competitive and hard to beat! Come down and talk to our product specialists and we'll play matchmaker to find the love of your dreams! Visit us in the pre-owned building today!